Church should be a safe place, right? Then why do so many get hurt there? Ray Beeson and Chris Hayward combine their years of ministry experience to address head-on the elephant in the room: church members and church leaders hurt Christians. All the time. And the long-lasting effects—rejection, shame, despair, loneliness, fear—can be devastating. 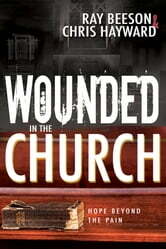 The authors have witnessed the rise of the “dones,” those who are just done with God thanks to scars from church. With first-person stories of hurt and loss, this book is a wake-up call for any who deny woundedness in the church but is also a redemptive message for any who hurt from church wounds. Leaders and laypeople alike will learn how to grieve over abuse, to leave unhealthy attitudes and patterns that cause pain, and to trust in God’s real, delivering work through churches that build up, not tear down. Thanks to the grace of God, there is always hope beyond the pain.